Nikki Sixx, co-found, bassist and primary songwriter for the legendary rock band Mötley Crüe has signed with SESAC for songwriter representation. Mötley Crüe’s Nikki Sixx signs with SESAC. Nikki Sixx, co-founder, bassist and primary songwriter for the legendary rock band Mötley Crüe, has signed with SESAC for songwriter representation, as of January 1, 2015. Sixx’s songwriting catalog includes “Home Sweet Home,” which, in addition to being a top hit for Mötley Crüe, has been covered by numerous artists, including Carrie Underwood. Since Mötley Crüe’s formation in 1980, the Grammy-nominated rock group has established themselves as one of music’s most revered, celebrated and notorious bands in history. The band has sold over 100 million albums globally reaching seven platinum or multi-platinum certifications. They have chalked up 22 Top 40 mainstream rock hits, including such classics as “Kickstart My Heart”, “Home Sweet Home,” “Dr. Feelgood,” “Girls Girls Girls” and “Shout At The Devil” – all written by Sixx - and honored with a star on the Hollywood Walk of Fame. Mötley Crüe also scored three Grammy nominations for Best Hard Rock Performance and countless sold-out tours across the globe, playing to millions and generations of fans. Always musical innovators, they were also the first rock band to do a rock residency in Las Vegas, setting a trend for their contemporaries. In addition to currently traveling the globe on Mötley Crüe’s FINAL TOUR, Sixx is also busy hosting “Sixx Sense,” his daily syndicated radio show which is carried in over 100 cities across North America. Sixx is a New York Times best-selling author receiving praise for his books, This Is Gonna Hurt and The Heroin Diaries, which is currently being developed into a Broadway play. Sixx recently released the third album of his band, Sixx:A.M. - entitled MODERN VINTAGE - with bandmates James Michael and DJ Ashba, about which Artist Direct said “This is what a classic rock record should sound like in 2014. This is SIXX:AM's finest hour thus far!” The band’s new single “Stars” is already making its way up the charts. SIXX:A.M.’s previous two albums, THE HEROIN DIARIES and THIS IS GONNA HURT – both of which were accompanied by books of the same name - have sold over 600,000 copies and spawned 2 number one radio singles, “Life Is Beautiful” and “This Is Gonna Hurt”. Established in 1930, SESAC is a service organization created to serve both the creators of music and music users through music licensing and timely, efficient royalty collection and distribution. The second oldest and fastest growing performing rights organization in the U.S., SESAC is known for its diversified repertory that includes genres ranging from Adult Contemporary, Urban, Jazz, Rock, Americana, Contemporary Christian, Latin, Country, Gospel, Dance, Classical and New Age. SESAC is also the performing rights organization of choice among many of Hollywood's most sought-after film and television composers. Headquartered in Nashville, the company also has offices in New York, Los Angeles, Atlanta, Miami and London. 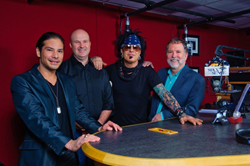 Pictured (left to right): SESAC’s Glen Phillips and Sam Kling, Sixx and SESAC’s Dennis Lord.